This is a brand new Bolt On Spring Solo Seat Mounting Kit that fits all of the Sportster Models for the 2010-2018 Sportsters. It includes Nightsters, 48, 72 and Irons and more! This kit was designed and manufactured by us. 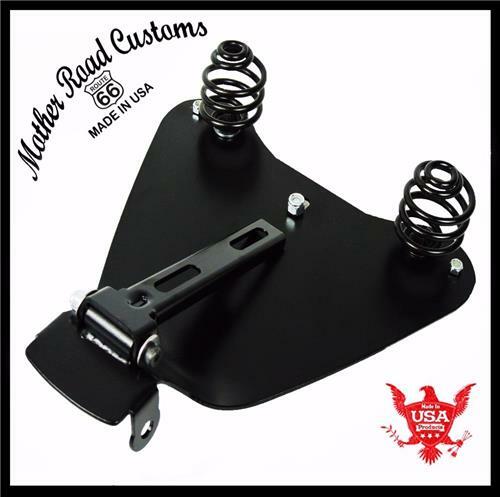 Now All 2010-2018 Sportster owners can mount a spring solo seat to there bikes without modifications! This kit is is 100% bolt on, and all the parts are included for a spring solo seat mounting, execpt the seat. Seats can be purchase in my listings and my store. The kit is sturdy professionaly Powder coated 1/8" steel. The kit includes coil springs and necessary mounting hardware. The spring bolts are 7" on center. With this kit nothing is permanently changed so one can switch back to the original seat at any time. Seats are sold separately in this listing. You can purchase just about any of our to go on this kit but most buy the 10x13", 11x14", 12x13" range seats for this kit. Let us know if you have any questions by sending us a message or call us at 314-972-4305.